June 29 Badge pick up & more! 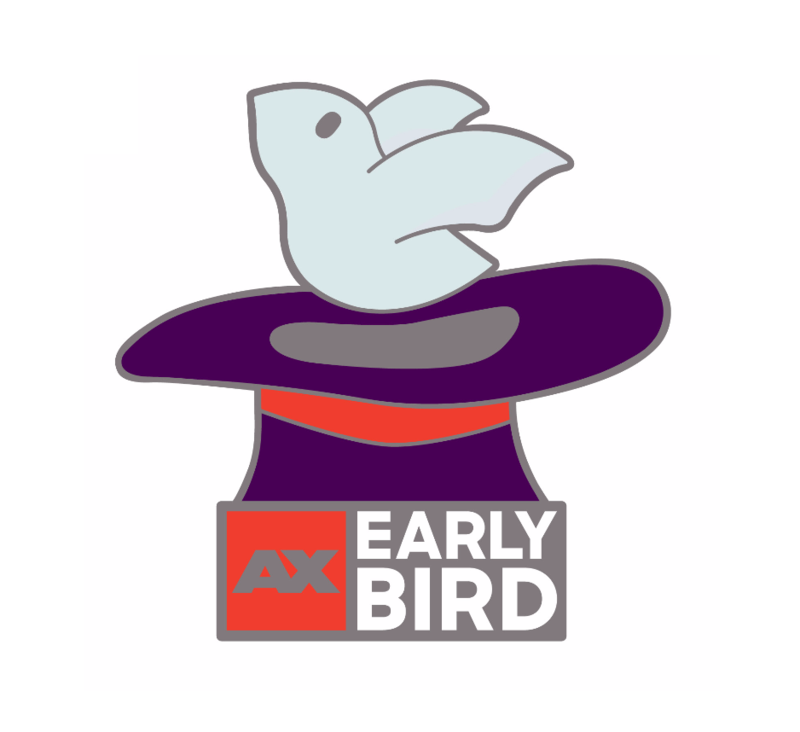 Stop by the AX Merchandise Booth to get an exclusive early bird pin (pictured right), free with purchase (while supplies last). 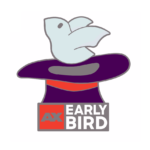 Visit the Info Services booth to get a code to unlock the “Early Bird” badge in The AX Challenge in the Official Mobile App. June 30 is Pre-Show Night! Pre-Show Night starts at 6 PM! Get access to panels, the entire Entertainment Hall, Karaoke, Manga Lounge, AMV Theatre, AX Dance, Lounge 21, Screenings, and Tabletop Gaming. Pre-Show Night will feature the Food Wars Dub Premiere, Full Metal Panic 15th Anniversary Panel with light novelist Shoji Gatoh and illustrator Shiki Doji. Check out the schedule to learn more about what’s going on during Pre-Show Night. Use discount code AX 2017 for a 50% discount (expires June 29). Register today! 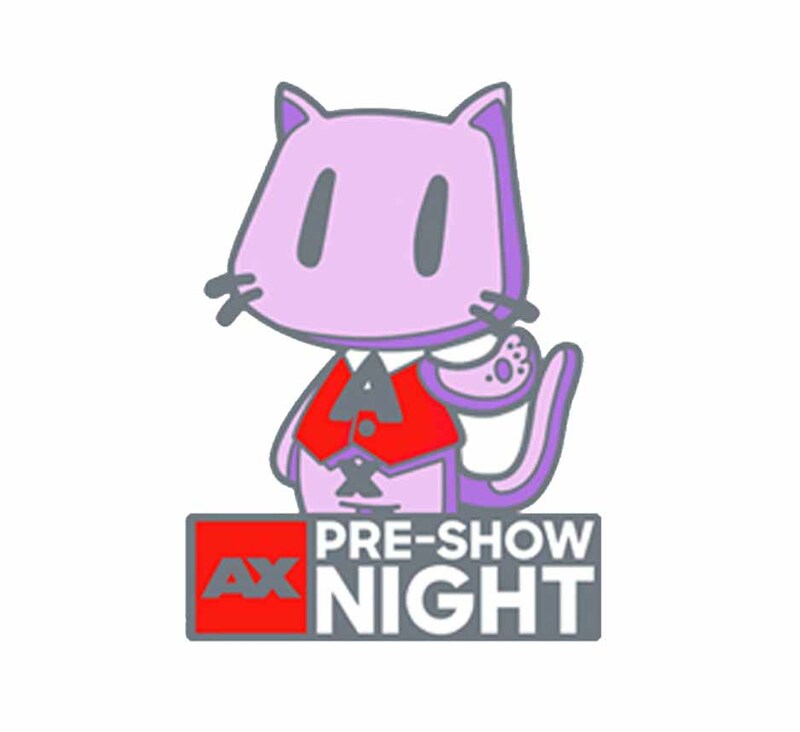 Visit the new AX Merchandise Booth in West Hall Lobby to get the Pre-Show Night pin (pictured right), which is exclusively available on June 30th to attendees with access to Pre-Show Night. Pre-Show Night Fast Track Badge Pick-Up! If you have a Pre-Show Night badge, you can use the Fast Track entrance to pick it up, as well as your 4-day and 1-day badge(s). To pick up your badge, be sure to bring your photo ID and the QR code in your confirmation email (either via a print out or via your phone). 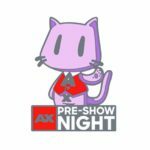 For more information about how to pick up your badge, please see the “How to Attend AX” guide. If you are having any issues with registration such as mistyped email or would like to upgrade from a 1-day to 4-day badge, please visit Customer Service in the Registration Area. Deadline for refunds, name changes, transfers was on June 1st. The Ticketing Booth is located in West Hall of LACC, on the second level just outside on the Petree Plaza. (If you are facing the stairs/escalators leading up to the Entertainment Hall, it’s on the right side out the glass doors.) For more information about how to pick up tickets, please read the Ticketing FAQ. *Early Bird pin free with purchase (while supplies last) on June 29 at the South Lobby location only. *Pre-Show Night pin available on June 30 at the West Hall Lobby location only.